Medium is important in the illustrated standard visualization. Coat and structure are important factors in correctly illustrating with pencil or pen and ink as a basis for drawings. The appearance of drawings in an illustrated standard may be influenced by coat type or by intended use. 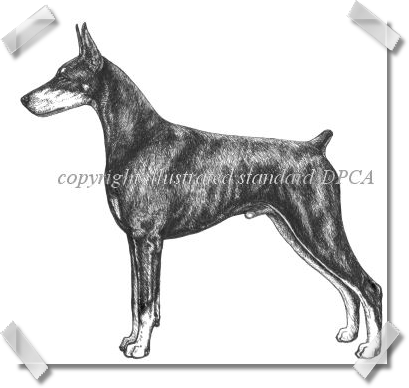 Final illustrated breed standard drawings may be executed in either pencil or pen & ink, and additional effects can be added to show dimension. Pencil has the greater flexibility. With more advanced finishing techniques now available, depth and dimension can be enhanced once the basic drawing is completed by using shading techniques not available with either pen or pencil alone. Pencil can be soft, but it can also give a sharper edge or additional shading with the aid of the computer. Pencil allows for variations in shading, as it can be lighter or darker. Pencil also has varying sharpness and line width with different leads. It is, by far, the more versatile of the mediums for the basic drawing. Breed standard drawings are still executed in the conventional method, but additional steps can be incorporated to achieve a more complex result and polished final illustrated standard. The artist should always digitize illustrated standard drawings for your club. In any illustrated standard project, files should be digitized for better use in either print or online publication. The artist should do this for you. The process is more involved than in the past when drawings were completed solely on paper and the club was limited to the number of changes allowed for the simple reason that paper and drawing deteriorate after erasing or "white out." That is no longer the case. The drawing is now completed on paper and then scanned into the computer. Once it is on the computer as a digital file, the background and any surrounding fragments are eliminated. This ensures that the drawing will be able to be used to fill various types of space without a bounding box interfering with placement. It makes a nice presentation if it is desired to place the illustration against a different type of background, such as is demonstrated by the moving Alaskan Malamute illustration on this page. Once the drawing has been digitized and cleaned for the first time, the committee may review the drawing and decide that changes are needed. Changes can then be completed without destroying parts of the original illustration that may be involved. It is a process with many steps, but is worth the effort. At each stage, changes must be completed and incorporated back into the drawing. Do not let someone else who has a photo editing program do this. It is the job of the artist and should be done by the artist to achieve a united illustration with the best result. When approval is given for the illustration, it can then be finalized in its completed stage. That involves a more thorough cleaning and preparation of the drawing, then conversion to multiple file formats for easy use. With each drawing for the illustrated standard project, these extra steps assure that the end result will provide for maximum use and reproduction clarity. Pen & ink used in the illustrated standard generally allows for more precision and finer detail than pencil, but is harder edged. Pen & ink has only one shade so depends upon line width and density to convey shadows and contour. Technological advancements now allow for subtle shading effects to be added in the finished breed standard illustration if in pen & ink. 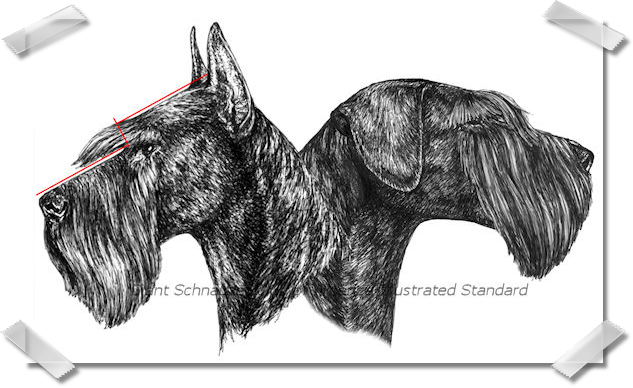 The heads of the Giant Schnauzers on this page were able to be merged into one illustration because they were completed as digital files. Originally, they were each separate drawings. Outward appearing coat and contours can be achieved equally well using either medium. The coat type often dictates which medium is best suited for the particular breed standard to be illustrated. 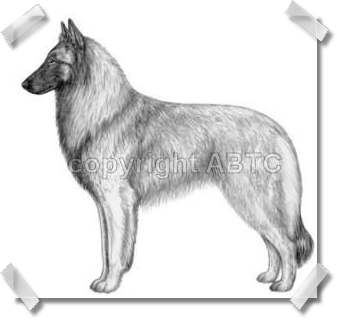 Highlights and shadows can lend dimension to a breed standard drawing. This is a more complex process and requires the conventional breed standard drawing plus the addition of computer enhanced shading. It is particularly useful in demonstrating coat patterns and marking variation. It can also add a great deal of dimension to any drawing within the illustrated standard.